1 classic training method to change your life. 4 Core loves seeing people making the most of their life by smashing goals! BRISTOL TV has done a feature on inspiring fitness role model Claire Tiley, who shares some incite into the mental and physical preparation needed for a 10K run. With sheer determination and focus, Claire has put in a lot of work to be able to accomplish an achievement such as this! Bristol TV requested us to showcase a selection of exercises suitable for someone training in a 10K race. A solid base is imperative for a run of this distance. The acts of walking, running, lifting or climbing all come from our core area. The body must to behave like a well oiled machine to ensure optimum results! If you are considering a 10K run, it is important you do everything possible to ensure a great result. 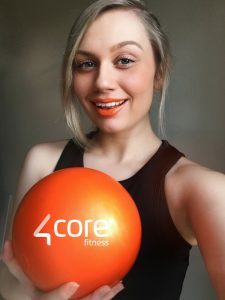 Seeing as your core is the one connection between all of your limbs, it makes sense that it should work at optimum level. A strong core enables improve running posture, increased speed and strengthening of the limbs! Have you been wondering how to train your core effectively? 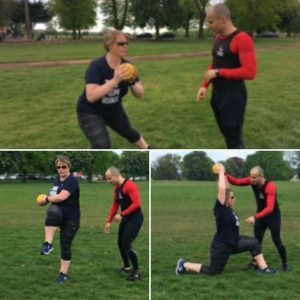 Despite the technological advancements in gym equipment, 4Core recommends classic medicine ball training to strengthen the core.